BentoLunch.net - What's for lunch at our house: Preschool Bento #36 - Fresh Berries & Bagels! 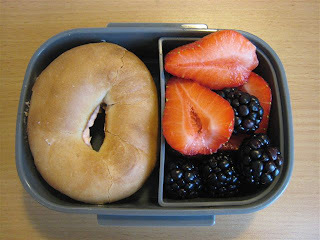 Preschool Bento #36 - Fresh Berries & Bagels! Last week, I discovered the secret to grocery shopping just might be reading the sale ads and planning your shopping trips. I'm sure this is no surprise to the rest of the world, but I'm more of a run-to-Kroger-because-I'm-out-of-food kind of person. However, I tried some new stores, got some good deals and stocked up on some of F&B's favorite foods because I actually went to more than one store! Ben had a fresh bagel with strawberry cream cheese (Aldi's bagels were much much cheaper than Kroger) and fresh blackberries & strawberries from Sprouts. I love the color of fresh berries over the frozen ones--so happy they are in season again! I love the mini-bagels from Aldi! you're an incredible mom! i love all the healthy snacks you prepare for your son... just awesome!! i loved browsing through your bento meals! i wish these meals were big enough for my lunch... i'll have to expand on them a little.